This article provides an overview of several of the most important new technologies developed for the 5G Networks. To meet the 5G design vision, service and performance requirements, new technologies were required; some are extensions of 4G and, some are developed explicitly for 5G. 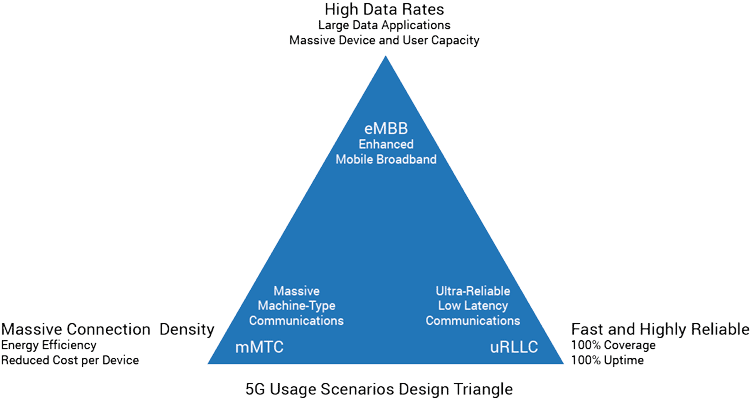 5G network performance and design goals are commonly described with three core targets. eMBB: High Data Rate: Enhanced mobile broadband enables ultra-high data-rate communications, enhanced mobility and broader network coverage. 5G networks have a similar performance and user experience as Ethernet networks. uRLLC: Low Latency, High Reliability: Ultra-Reliable Low-Latency Communications is critical for public safety, electronic health, medical automation, self-driving cars, and the “tactile” internet. mMTC: Internet of Things: Massive Machine-To-Machine Communications provides ubiquitous connectivity to an extremely large number of devices. These devices will require a high density of network connections, energy efficiency for extended battery life and reduced cost per network connection. Below is a chart of 5G performance target parameters. 5G specified radio frequencies are higher than frequencies used by 4G, which has advantages and challenges. Higher frequencies provide larger network bandwidth, lower latency and much higher connection density. Higher frequencies also have challenges with reduced transmission distances, requiring a larger number of smaller cells. 5G network frequency range begins at 5GHz. The 5G network frequencies are called Millimeter Wave Bandwidth (mmWave) and are 24GHz and above. 4G frequencies ranged from 700MHZ to 2.5GHz. Advances in signal processing electronics now support full-duplex network communications on the same frequency. Earlier technologies required different frequencies to transmit and receive data simultaneously. Full duplex reduces radio frequency usage by half, doubling the number of devices that can be supported on cell towers. Transmission signal power requirements are calculated and the minimum amount of power is used to reduce client power output and extend battery life. Location positioning of the client device is identified when the session is established and is continuously updated for moving client devices. The client angle and distance are calculated at the 5G base station from the antenna array architecture and the 5G session protocols. The client geographical position can be calculated from the distance to the base station antenna and the angle off from perpendicular. The 5G calculated location position can be used for similar purposes as GPS systems but without the power requirements of GPS electronics. The speed and path of client devices in motion are monitored. 5G base station antennas must track client movements to direct radio beams directly at clients. 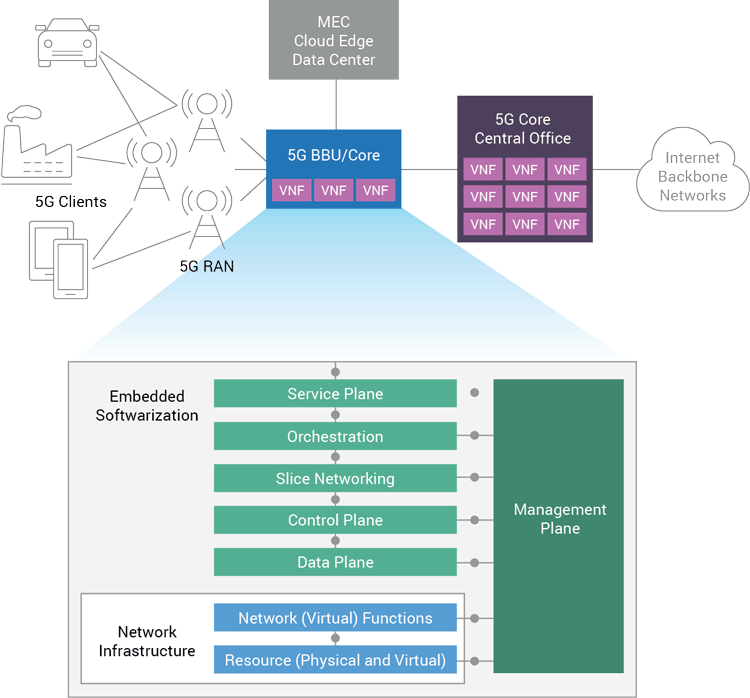 One of the core architectural requirements specified for 5G infrastructures is that all core network systems are based on software virtualization. Network infrastructures have traditionally included physical purpose-built appliances, which are less flexible to manage, deploy and scale. Network Functions Virtualization (NFV) is a network architecture based on Virtual Network Functions (VNF). Network functions include network routing, packet processing, security, and many others. Software Defined Networks (SDNs) are a virtualization technology that abstracts physical networks to virtual network structures. Virtual networks appear and behave like physical networks but have similar advantages of other virtualization technologies. The above diagram shows a simplified view of 5G core functions using NFV/SDN. The traffic management including services, orchestration, control and data packet management is implemented as a set of VNF chained services. The physical network resources are presented with a virtual network overlay using SDN. Device-to-device communications is an emerging trend in “smart” systems and IoT devices that communicate and share data and knowledge, and then to potentially act on this knowledge. Fog computing, for example, is based on IoT devices communicating and sharing data. Logical network slices create tenant or service-specific networks. The network slicing creates end-to-end isolated logical networks starting from the mobile edge, continuing through the RAN mobile transport through the 5G core. Tenants are service providers delivering specific services over the network. These tenants will have specific network requirements such as reliability, latency or bandwidth. Service-specific networks will have key performance indicator (KPI) requirements to meet a specific business need. In the diagram above, NFV and SDN technologies have been used to create four isolated and independent logical networks. The 5G network resources are “sliced.” Each network slice has different network performance specifications for different use case or business requirements. Multi-tenancy uses network slicing and subscriber awareness to create isolated logical networks for independent service providers. Tenant networks can be defined with different performance characteristics and service levels. In the above diagram, Tenant A has an isolated logical network provided by network slicing. 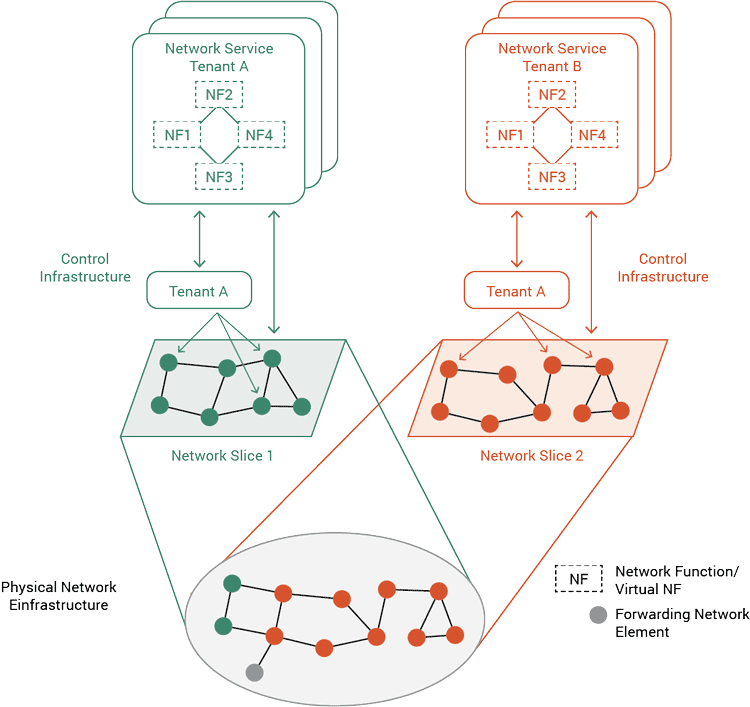 Tenant A and B share a common physical network infrastructure. Multiple Input Multiple Output (MIMO) is a technology that uses multiple antennas configured in a two-dimensional phased array. The MIMO antenna system is attached to a base station that controls the transmission and reception of radio signals. Massive MIMO systems are larger MIMO systems with up to several hundred antennas. Massive MIMO systems can handle large volumes of network throughput and support large numbers of client connections, which is a core performance requirement for 5G networks. What is Carrier Grade NAT (CGN/CGNAT)?